00:35:00 Makes 6 servings, 1-1/3 cups (325 mL) each. Makes 6 servings, 1-1/3 cups (325 mL) each. A wonderfully hearty and full-flavoured dish. Meanwhile, cook sausage and peppers in large skillet on medium-high heat 15 min., stirring peppers and turning sausage occasionally. Stir in sauce; cover. Simmer on medium heat 10 min. or until heated through, stirring occasionally. Drain pasta. Add to skillet; mix lightly. Sprinkle with cheese. 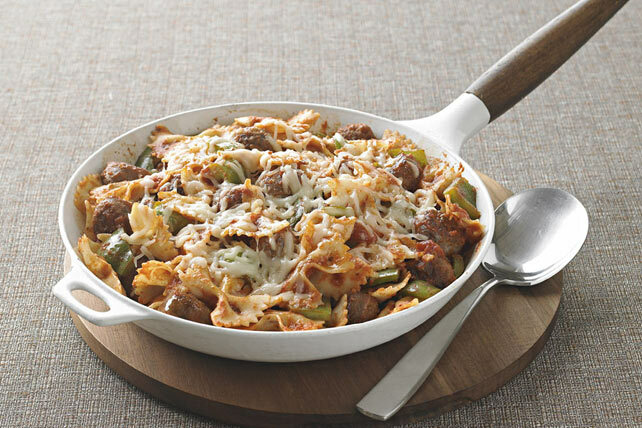 Prepare using Italian turkey sausage. Serving Size Makes 6 servings, 1-1/3 cups (325 mL) each.